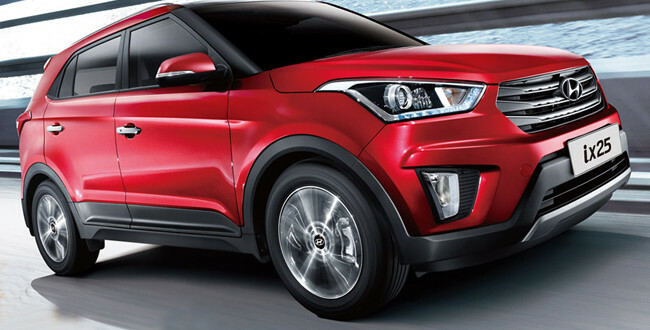 The much anticipated SUV, by the South Korean car giant Hyundai, the Creta (ix25) was finally launched in India today i.e. on 21 July,2015. This compact SUV is all set to give its competitors like The Ford EcoSport, The Nissan Terrano and The Renault Duster a stiff competition. This compact SUV comes with a price tag of Rs 8.59-11.19 lakh. Talking about the design element of the car, this compact SUV shares some design features from the new i20 hatchback which is based on the company’s Fluidic 2.0 dseign philosophy and so the Creta comes loaded with features like projector headlamps with LED daytime running lights, touchscreen infotainment system and automatic climate control. Under the hood, the all new compact SUV comes power packed with an option of 1.6 or 1.4 petrol/diesel engine coupled with a 6-speed manual or automatic transmission box with a choice between FWD and AWD. This new compact SUV by Hyundai, comes equipped with safety features like ABS, EBD and 4 airbags. The car measures 4.27 m long, 1.78 m wide and stands 1.63 m tall, with a wheelbase of 2.59m.